The effective integration between the built and natural aspects of a landscape is vital to the overall appearance and feeling of your landscape project. Hardscapes help give structure, dimension, and definition to a landscape while blending with the surrounding architecture and setting. Decks and patios facilitate the creation of outdoor 'rooms', which could be further enhanced with spas and outdoor kitchens to bring the ambiance of the indoors to the outdoor landscape. Additional overhead structures such as trellis' and pergolas can offer shelter and privacy, in addition to providing support for climbing plants. Patios constitute an important aspect of a landscapes hardscape, creating an outdoor room that is functionally effective for entertaining or relaxation. Whether your project requires a large driveway and entry or small, private sitting area, Landscape Design and Landscape Construction, Inc. offers professional installation of all forms of patio hardscapes. Typical patio material choices include pavers, concrete, and natural stone. By creatively designing a series of interrelated patios connected by steps or pathways, this form of hardscape provides a sense of space to any project. 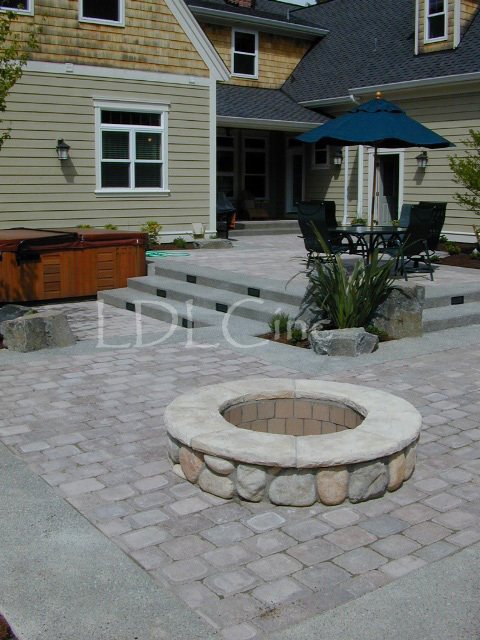 Pavers: The use of interlocking concrete pavers is the most popular option that will enhance your patio space. Its' versatility and beauty provides a structural surface to meet the requirements of any patio project. Concrete: Concrete is often considered as a commercial application, but with proper design and style choices, this surface can offer an effective solution to fill virtually any situation and budget. Natural Stone: Patios created using natural flagstone exude a very rustic and comforting feeling, while bringing a beautiful result to your garden experience. Professionally designed deck systems offer several possibilities to enhance the outdoor living space of the home. In addition to expanding the functional space of the indoors, decks are also effective in redefining grade by bridging slopes or bumps found in the topography of a site. With the incorporation of trellises, built-in benches, or handrails, the deck forms a connection between the natural landscape and built architectural characteristics of the property. Carefully located detached decks may also provide a delightfully quiet retreat within the surrounding landscape. Landscape Design and Landscape Construction, Inc. is proficient in the application of a variety of decking materials, including cedar, pressure treated, recycled and man-made decking (i.e. Trex), and ironwood. Functioning as a link between elements in the landscape, a pathway provides a garden with structure and opens the spaces to exploration. Pathways transform a stagnant site into a series of experiences by creating a sense of mystery that leads you into the depths of the landscape. Steps are often incorporated, adding functionality to an otherwise inaccessible location. Integrating the formality of a symmetrical design or the informality of a rustic pathway captures the essence of a sites character. Major pathway systems offer such material choices as concrete or pavers, while rustic systems capture the natural qualities of flagstone or gravel. Arbors and trellises add a unique vertical element to the landscape while defining the suggested boundaries of outdoor spaces. These structures invite the comforts of privacy and shade to any outdoor location. Pergolas and arbors are also effective tool in directing pedestrian traffic. While providing support for plant material, trellises and other garden structures may be used to screen unsightly views or frame priceless vistas. Landscape Design has been installing custom and prefabricated hot tubs for 15 years. Whether the tub is a simple soaker or a complete jetted spa, we can place and blend it into an existing setting or create an entirely new experience. Landscape Design has a unique way of incorporating recreational features into the landscape so the visual impact is minimal and the finished product appears to belong where it was placed. Ask how we handle Trampoline's! Outdoor barbeques and kitchens offer the comfort and convenience of indoor amenities. Since outdoor entertaining is often centered around the preparation of food, built-in barbeques provide a permanent structure that accommodates these activities. Including such amenities as a preparation area, storage cabinets, and refrigerator enhances the effectiveness of this feature in the hardscape. By incorporating a bar and serving area, guests are given a place to sit, relax, and appreciate the atmosphere of their surroundings. Materials used should reflect those used in other hardscape features of the home, including wood, stone, or stucco. One of the best opportunities homeowners have to enjoy their landscape is in the evening. Firepits and fireplaces add comfort and intimacy to gatherings while encouraging outdoor entertainment even in the cool evenings of the Northwest. With the advantage of adding subtle warmth and charming character, these features complement patio spaces, provides timeless beauty to any landscape, and extends the functional time of any landscape well into the evening.